DIE Veneris, videlicet, 24 Junii. Lord Mayor and Sheriffs to attend Tomorrow. Lord Lostus and Sir Ph. Manwaring. Message to the H. C. with a Proclamation published in the City. Report from the Scots Commissioners about the Earl of Antrim. E. of Antrim to be securedat Carickfergus till he can be sent to Dublin. and for the Ammunition for this Expedition. Mr. Hill to speak with L. Macguire. Message from the H. C. for L. Wharton to be L. Lieutenant of Bucks. Captain Ven's Men agree to find Arms. Message to the H. C. in Answer to their Requests. Order for 2000 l. to be paid to Sir Jo. Hotham, out of the Loanmoney. Order for disposing of the Magazine from Hull. An Ordinance for securing the Loan of 100000 l.
The Certificate of Mr. Justice Foster, concerning Lord Viscount Lostus, and Sir Philip Manwaring. The Petition of the Officers of the Bucks Militia for a new Lord Lieutenant, Lord Paget being gone to York. 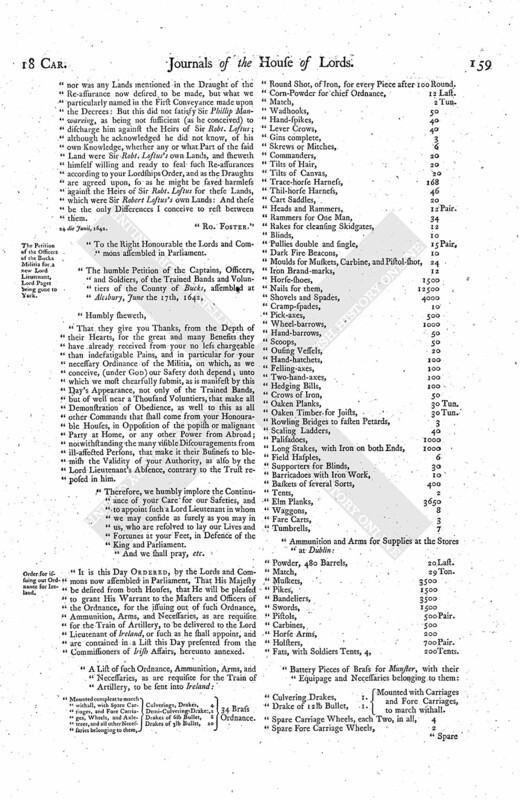 Order for issuing out Ordnance for Ireland. The Lord Wharton was appointed by the House to be Speaker this Day. It was informed, "That the Lord Mayor and Sheriffs of London are willing to obey their Lordships Order, to attend as this Day; but this Day being a Day when (fn. 1) they chuse all their Chief Officers, they desire another Day may be appointed:" Hereupon this House Ordered they should attend this House Tomorrow. Likewise a Petition of Sir Phillip Manwaringe's was read, concerning this Business. Ordered, That the Conveyances shall be sealed; and that the Lord Viscount Loftus and Sir Edw. Loftus shall give Recognizance of Five Thousand Pounds, that, if any Land be discovered to be any Land of Sir Robt. Loftus, that then he shall re-convey it within Three Months. To deliver to them a Proclamation, which was on Wednesday proclaimed in London, and pasted upon the Door where the Committee of London sit; and it was Yesterday brought to this House by some of the said Committee. The Earl of Bedford reported, "That he had delivered the Order of this House to the Scotts Commissioners, concerning the Earl of Antrim to be kept in safe Custody in Carrickfergus, or some other safe Place; and they desire to be excused from being responsable for his Safety, but that he may be committed to the Custody of the Mayor of Carrickfergus, or to any other Place, as their Lordships shall think fit." Hereupon it is Ordered, That the Lords Commissioners do desire the Scotts Commissioners, that they will take Care that the Earl of Antrim be kept in safe Custody in Carrickfergus, until such Time as further Direction shall be given to bring him to Dublin. 1. To desire their Lordships Concurrence in an Ordinance for raising of Men for Ireland. 2. To desire their Lordships Concurrence in the Order for the disposing of the Magazine that is come from Hull, with some Amendments. 3. To desire to agree with the House of Commons in some Instructions to be given to the Deputy Lieutenants of Warwickshire. Agreed to, with the Addition of these Words ["according to the Tenor of the said Ordinance"], Linea 13a, after the Word ["respectively"]. 4. To concur in a List of Ordnance, &c. desired out of His Majesty's Stores for Ireland, ordered to be sent to the King. 5. To concur in an Amendment in an Ordinance for securing the Loan of One Hundred Thousand Pounds to the City of London. 6. An Order to send Two Thousand Pounds to Sir Jo. Hotham, at Hull. 7. A List of the Officers Names to be employed in Ireland. 8. To present the several Propositions of Ammunition stated for the Train of Artillery in this present Expedition, (fn. 2) as is humbly desired. Ordered, That Gabriell Thorpe shall be bailed, to appear upon Warning. Ordered, That Mr. Hill shall have Leave to speak with the Lord Macguire privately. That the Lord Lieutenant of Buk. being withdrawn, a Petition of the Country, assembled at Alsebury, was delivered to both Houses, desiring that they might have another Lieutenant; and the House of Commons desired that the Lord Wharton may be Lord Lieutenant of Buks. Ordered, That this House approves of the Lord Wharton to be Lord Lieutenant of the County of Buckinghamshire. The Answer was returned as aforesaid Ordered. All the Persons that were sent for by the Information of Captain Ven, were brought; and all did willingly and voluntarily agree, and were willing, to find Arms, only one Cannon, who was a very poor Man, and Seventy-five Years of Age, who is referred to Captain Ven; and upon this, the Persons were discharged. 1. To the Order for disposing of the Ammunition that came from Hull. 2. In the Ordinance for securing the One Hundred Thousand Pounds to the City. 3. Agreed to the Order for the Two Thousand Pounds to be paid to Sir Jo. Hotham. 4. The Lords agree to the Instructions for the Deputy Lieutenants of Warwickshire, with the Amendments. 5. They concur in the List of Ammunition desired out of His Majesty's Store, for the Service of Ireland, with the Addition. 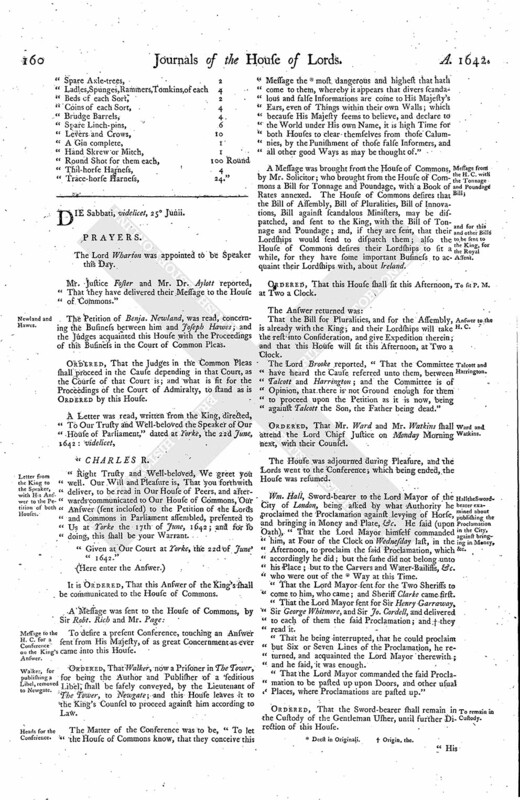 "It is this Day Ordered, by the Lords and Commons now assembled in Parliament, That the Treasurers of the Contribution and Loan-money in London do forthwith issue and pay Two Thousand Pounds, out of the Monies that are come in upon the Act of Contribution and Loan-money, unto Mr. Durand Hotham, or such as he shall appoint, for the Use of Sir John Hotham: And it is further Ordered, That the said Two Thousand Pounds be re-paid unto the said Treasurers, out of the Monies that shall come in upon the Bill of Four Hundred Thousand Pounds." "It is Ordered, That so much of the Arms and Ammunition that were brought from Hull shall be put into convenient Places, in Leaden-hall, Blackwellhall, Guildhall, Apothecaries-hall, and Lethersellershall, or in any such other Places within the City of London as the Committee for the Militia of the City of London shall think fit, to be kept there; and that the said Committees for the Militia of the City of London shall be hereby appointed to see this done, and take the said Arms and Ammunition by Inventory; and shall have Liberty to choose such Officers and Servants as they shall think fit, to take Care of this Charge; and that this House propound it to the House of Commons, to consider how they may have Wages allowed them for their Pains; and also how those Persons that have had the Arms and Ammunition in Care all this while may be satisfied for their Care; and that the Marshal of the Admiralty shall have an Order to deliver the said Arms and Ammunition to the said Committees for the Militia." "An Ordinance made by the Lords and Commons in Parliament, for the Securing of the Sum of One Hundred Thousand Pounds agreed to be lent to the Parliament by several Companies and Citizens of the City of London, for the Use of the Kingdom. 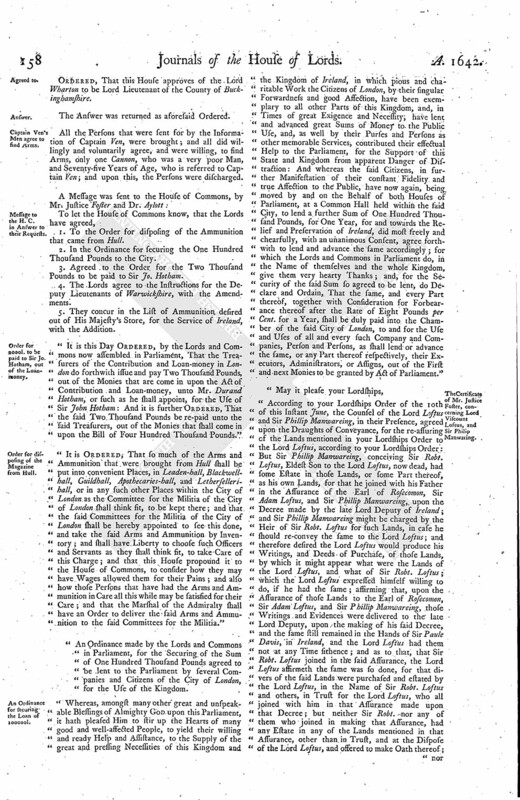 "Whereas, amongst many other great and unspeakable Blessings of Almighty God upon this Parliament, it hath pleased Him to stir up the Hearts of many good and well-affected People, to yield their willing and ready Help and Assistance, to the Supply of the great and pressing Necessities of this Kingdom and the Kingdom of Ireland, in which pious and charitable Work the Citizens of London, by their singular Forwardness and good Affection, have been exemplary to all other Parts of this Kingdom, and, in Times of great Exigence and Necessity, have lent and advanced great Sums of Money to the Public Use, and, as well by their Purses and Persons as other memorable Services, contributed their effectual Help to the Parliament, for the Support of this State and Kingdom from apparent Danger of Distraction: And whereas the said Citizens, in further Manifestation of their constant Fidelity and true Affection to the Public, have now again, being moved by and on the Behalf of both Houses of Parliament, at a Common Hall held within the said City, to lend a further Sum of One Hundred Thousand Pounds, for One Year, for and towards the Relief and Preservation of Ireland, did most freely and chearfully, with an unanimous Consent, agree forthwith to lend and advance the same accordingly; for which the Lords and Commons in Parliament do, in the Name of themselves and the whole Kingdom, give them very hearty Thanks; and, for the Security of the said Sum so agreed to be lent, do Declare and Ordain, That the same, and every Part thereof, together with Consideration for Forbearance thereof after the Rate of Eight Pounds per Cent. 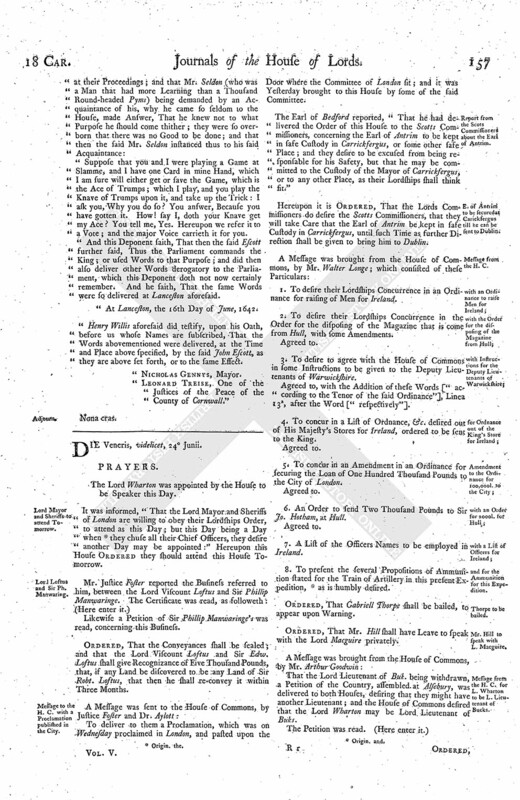 for a Year, shall be duly paid into the Chamber of the said City of London, to and for the Use and Uses of all and every such Company and Companies, Person and Persons, as shall lend or advance the same, or any Part thereof respectively, their Executors, Administrators, or Assigns, out of the First and next Monies to be granted by Act of Parliament." "According to your Lordships Order of the 10th of this Instant June, the Counsel of the Lord Lostus and Sir Phillip Manwareing, in their Presence, agreed upon the Draughts of Conveyance, for the re-assuring of the Lands mentioned in your Lordships Order to the Lord Loftus, according to your Lordships Order: But Sir Phillip Manwareing, conceiving Sir Robt. Loftus, Eldest Son to the Lord Loftus, now dead, had some Estate in those Lands, or some Part thereof, as his own Lands, for that he joined with his Father in the Assurance of the Earl of Rosecomon, Sir Adam Loftus, and Sir Phillip Manwareing, upon the Decree made by the late Lord Deputy of Ireland; and Sir Phillip Manwareing might be charged by the Heir of Sir Robt. Loftus for such Lands, in case he should re-convey the same to the Lord Loftus; and therefore desired the Lord Loftus would produce his Writings, and Deeds of Purchase, of those Lands, by which it might appear what were the Lands of the Lord Loftus, and what of Sir Robt. Loftus; which the Lord Loftus expressed himself willing to do, if he had the same; affirming that, upon the Assurance of those Lands to the Earl of Rosecomon, Sir Adam Loftus, and Sir Phillip Manwareing, those Writings and Evidences were delivered to the late Lord Deputy, upon the making of his said Decree, and the same still remained in the Hands of Sir Paule Davis, in Ireland, and the Lord Loftus had them not at any Time fithence; and as to that, that Sir Robt. Loftus joined in the said Assurance, the Lord Loftus affirmeth the same was so done, for that divers of the said Lands were purchased and estated by the Lord Loftus, in the Name of Sir Robt. Loftus and others, in Trust for the Lord Loftus, who all joined with him in that Assurance made upon that Decree; but neither Sir Robt. nor any of them who joined in making that Assurance, had any Estate in any of the Lands mentioned in that Assurance, other than in Trust, and at the Dispose of the Lord Loftus, and offered to make Oath thereof; nor was any Lands mentioned in the Draught of the Re-assurance now desired to be made, but what we particularly named in the First Conveyance made upon the Decrees: But this did not satisfy Sir Phillip Manwareing, as being not sufficient (as he conceived) to discharge him against the Heirs of Sir Robt. Loftus; although he acknowledged he did not know, of his own Knowledge, whether any or what Part of the said Land were Sir Robt. Loftus's own Lands, and sheweth himself willing and ready to seal such Re-assurances according to your Lordships Order, and as the Draughts are agreed upon, so as he might be saved harmless against the Heirs of Sir Robt. Loftus for these Lands, which were Sir Robert Loftus's own Lands: And these be the only Differences I conceive to rest between them. "To the Right Honourable the Lords and Commons assembled in Parliament. "That they give you Thanks, from the Depth of their Hearts, for the great and many Benefits they have already received from your no less chargeable than indefatigable Pains, and in particular for your necessary Ordinance of the Militia, on which, as we conceive, (under God) our Safety doth depend; unto which we most chearfully submit, as is manifest by this Day's Appearance, not only of the Trained Bands, but of well near a Thousand Voluntiers, that make all Demonstration of Obedience, as well to this as all other Commands that shall come from your Honourable Houses, in Opposition of the popish or malignant Party at Home, or any other Power from Abroad; notwithstanding the many visible Discouragements from ill-affected Persons, that make it their Business to blemish the Validity of your Authority, as also by the Lord Lieutenant's Absence, contrary to the Trust reposed in him. "Therefore, we humbly implore the Continuance of your Care for our Safeties, and to appoint such a Lord Lieutenant in whom we may conside as surely as you may in us, who are resolved to lay our Lives and Fortunes at your Feet, in Defence of the King and Parliament. "And we shall pray, etc. "It is this Day Ordered, by the Lords and Commons now assembled in Parliament, That His Majesty be desired from both Houses, that He will be pleased to grant His Warrant to the Masters and Officers of the Ordnance, for the issuing out of such Ordnance, Ammunition, Arms, and Necessaries, as are requisite for the Train of Artillery, to be delivered to the Lord Lieutenant of Ireland, or such as he shall appoint, and are contained in a List this Day presented from the Commissioners of Irish Affairs, hereunto annexed. "Mounted compleat to march withall, with Spare Carriages, and Fore Carriages, Wheels, and Axletrees, and all other Necessaries belonging to them, Culverings, Drakes, 4 34 Brass Ordnance. "Round Shot, of Iron, for every Piece after 100 Round. Corn-Powder for chief Ordnance, 12 Last. Heads and Rammers, 12 Pair. Oaken Timber for Joists, 30 Tun. "Powder, 480 Barrels, 20 Last. Fats, with Soldiers Tents, 4, 200 Tents. "Culvering Drakes, 1. Mounted with Carriages and Fore Carriages, to march withall. "Drake of 12lb Bullet, 1.